Nigeria girls pictures that shamed the country! We know we’re evolving. The Fashion world is evolving, Cloths are now getting smaller and more trendy, AND what is more, we have an instant access to share our pictures to show the world. Today on Entertainmentgistme.com, I will be listing here, 15 Nigerian girls who shamed this country by displaying their assets online. According to some Nigerian girls, fashion these days is just an excuse to go half Νaked and show off their body. While I think it’s not bad trying to look more seductive, it’s wrong going overboard. A popular thought is “if you’ve got it, flaunt it.” This seems to be the motor for the ones that display their bosom everywhere they go and displaying even at the wrong times. The bare-it trend is taking over and pictures of girls exposing private areas keep surfacing online, which makes responsible Nigerians chagrin. If fashion is a form of expression, what are these girls trying to express? 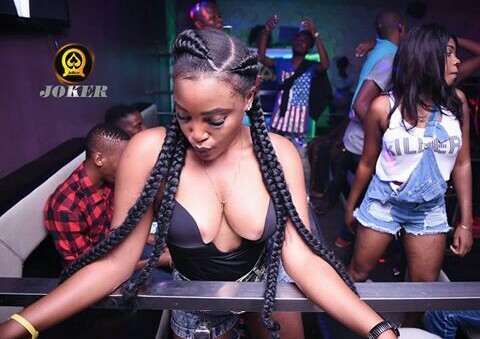 As you can see from the picture above, these are two girls, and the one in black, looks like Ebube Nwagbo, but these ladies decided to share this picture on Whatsapp. This is very awkward, as you can see from the picture above, the man seems to have a girl facing him, while the other bend away from him. It’s no doubt that this is a party, and they’re very happy when this picture was taken. What do you think? Do you think this photos did share Nigerians internationally, or it’s a very much normal photo? I would love to hear your thoughts and how you view these pictures shared above. You can use the comment box below, and share your thoughts, ideas with us.